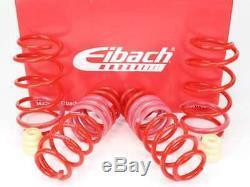 Eibach Sportline 45/40mm Audi A3 8V1 8As 8VA Seat Leon 5F1 Leon SC 5F5 Scoda Octavia 5E3 + Combi 5E5. 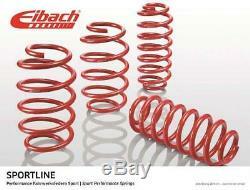 Eibach Sportline E20-15-021-04-22 Tieferlegungsfedern lowering springs Kit de suspensión, muelles. Tieferlegung Vorderachse / lowering front axle 45 mm Tieferlegung Hinterachse / lowering rear axle 40 mm. Max Achslast vorne / max. Front axle load 1070 kg max Achslast hinten / max. Rear axle load 1010 kg Für Fahrzeuge mit Starrachse hinten und Automatik oder DSG Getriebe!!! AUDI;A3 (8V1);1.8 TFSI 180PS AUDI;A3 (8V1);1.6 TDI 105PS AUDI;A3 (8V1);1.6 TDI 110PS AUDI;A3 (8V1);2.0 TDI 110PS AUDI;A3 (8V1);2.0 TDI 136PS AUDI;A3 (8V1);2.0 TDI 143PS AUDI;A3 (8V1);2.0 TDI 150PS AUDI;A3 (8V1);2.0 TDI 184PS AUDI;A3 Limousine (8VS);1.8 TFSI 170PS AUDI;A3 Limousine (8VS);1.8 TFSI 180PS AUDI;A3 Limousine (8VS);2.0 TDI 110PS AUDI;A3 Limousine (8VS);2.0 TDI 136PS AUDI;A3 Limousine (8VS);2.0 TDI 143PS AUDI;A3 Limousine (8VS);2.0 TDI 150PS AUDI;A3 Limousine (8VS);2.0 TDI 184PS AUDI;A3 Sportback (8VA);1.8 TFSI 180PS AUDI;A3 Sportback (8VA);1.6 TDI 105PS AUDI;A3 Sportback (8VA);1.6 TDI 110PS AUDI;A3 Sportback (8VA);2.0 TDI 136PS AUDI;A3 Sportback (8VA);2.0 TDI 143PS AUDI;A3 Sportback (8VA);2.0 TDI 150PS AUDI;A3 Sportback (8VA);2.0 TDI 184PS SEAT;LEON (5F1);1.8 TSI 180PS SEAT;LEON (5F1);1.6 TDI 90PS SEAT;LEON (5F1);1.6 TDI 105PS SEAT;LEON (5F1);1.6 TDI 110PS SEAT;LEON (5F1);2.0 TDI 110PS SEAT;LEON (5F1);2.0 TDI 143PS SEAT;LEON (5F1);2.0 TDI 150PS SEAT;LEON (5F1);2.0 TDI 184PS SEAT;LEON SC (5F5);1.8 TSI 180PS SEAT;LEON SC (5F5);1.6 TDI 90PS SEAT;LEON SC (5F5);1.6 TDI 105PS SEAT;LEON SC (5F5);1.6 TDI 110PS SEAT;LEON SC (5F5);2.0 TDI 110PS SEAT;LEON SC (5F5);2.0 TDI 143PS SEAT;LEON SC (5F5);2.0 TDI 150PS SEAT;LEON SC (5F5);2.0 TDI 184PS SKODA;OCTAVIA (5E3);1.6 TDI 90PS SKODA;OCTAVIA (5E3);1.6 TDI 105PS SKODA;OCTAVIA (5E3);1.6 TDI 110PS SKODA;OCTAVIA (5E3);2.0 TDI 143PS SKODA;OCTAVIA (5E3);2.0 TDI 150PS SKODA;OCTAVIA (5E3);2.0 TDI RS 184PS SKODA;OCTAVIA Combi (5E5);1.6 TDI 90PS SKODA;OCTAVIA Combi (5E5);1.6 TDI 105PS SKODA;OCTAVIA Combi (5E5);1.6 TDI 110PS SKODA;OCTAVIA Combi (5E5);2.0 TDI 143PS SKODA;OCTAVIA Combi (5E5);2.0 TDI 150PS. The item "Eibach Sportline 45mm Federn springs Seat Leon 5F1 Leon SC 1.8TSI 1.6TDI 2.0TDI" is in sale since Wednesday, November 8, 2017. This item is in the category "Auto & Motorrad\ Teile\Auto-Tuning & -Styling\Sportfederung\Tieferlegungsfedern". eu" and is located in Berlin. This item can be shipped to European Union member countries.